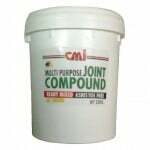 CMI JOINT COMPOUND JC 3000 | CMI Marketing Sdn. Bhd. Colour : White — off white. Filler : Combination of high grade limestone. Additives : Water soluble polymers for improving consistency, water retention & Adhesion. Water Demand : Approximately 50 % on dry material. Drive nail heads below panel surface without damaging paper face. Fill space between panels with compound using 5″ knife, center and press in joint tape. Tightly embed tape with knife, remove excess compound and apply it as a thin coat over the tape. Spread smooth with long parallel strokes. Apply compound over nail heads. When dry, use damp sponge to smooth any uneven surface. Apply second coat alongjoints using 8″ knife smoothing out 2″ inch beyond first coat. When dry, smooth surface with damp sponge. Apply a thin finish coat over second coat alongjoints using a 10″ knife and nail heads using 5″ knife. Apply compound to both sides of angle using a 5″ knife. Fold tapes along its centerline to press into angle and embed with knife. Remove excess compound and reuse over the tape by skimming over with a thin layer. When dry, use a damp sponge to smoothen any uneven surface. Apply a second coat as a finishing coat, feathering outside the edges of the first coat slightly. often. If dry sanding, use 150 grit sandpaper wrapped around a piece of wood to avoid scuffling panel paper. Surface must be dry, dust free and not glossy, and apply primer coat of CMI JOINT COMPOUND JC 3000 first coat or latex flat wall paint. Before painting, texturing or wallpapering, consult manufacturers direction. For textured finish, use a paintbrush to apply ample amounts of compound. Texture surface immediately using paint rollers, sponges, crumpled paper or other tools for desired effect. Allow compound to dry completely before decorating. Allow 24 hours between applications & before decorating. Wash tools immediately after use with soapy water. Wipe tools dry to prevent rusting. 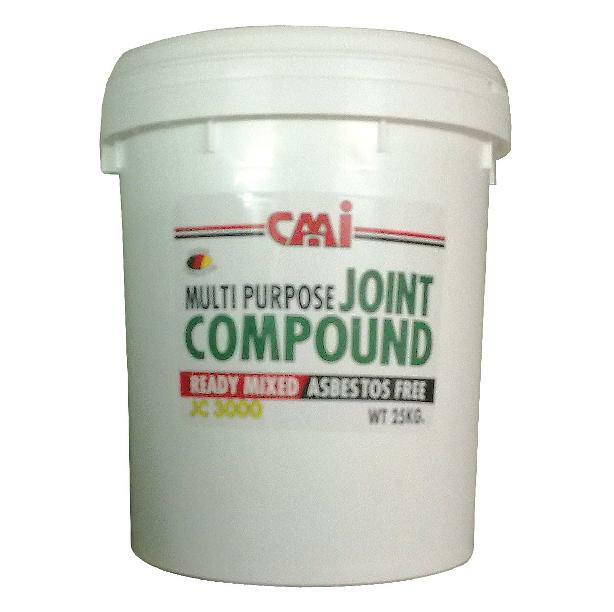 CMI Joint Compound JC 3000 can be stored up to one year if unopened and stored in a cool and dry area. Unused mixed compound must be kept tightly sealed and stored in a dry area.